His Holiness Mirza Masroor Ahmad, Khalifatul Masih Al-Khaamis was born on September 15th, 1950 in Rabwah, Pakistan to Hadhrat Sahibzada Mirza Mansoor Ahmad and Hadhrat Sahibzadi Nasira Begam Sahiba. He is the Great Grandson of The Promised Messiah a.s., Grandson of Hadhrat Mirza Sharif Ahmad r.a, and maternal grandson of Hadhrat Khalifatul Masih II r.a. In 1976 he earned his Masters of Science degree in Agricultural Economics from the Agriculture University Faisalabad, Pakistan. In 1977 he devoted his life (Waqfe Zindagi) for the service of Islam and went to Ghana under the Nusrat-Jahan Scheme, which supports a large number of hospitals and schools in West Africa. From 1977 to 1985 in Ghana, he was the Principal of Ahmadiyya Secondary School Sagala for 2 year, Principal of Ahmadiyya Secondary School Easarcher for 4 years, and was Manager of Ahmadiyya Agricultural Farm in Northern Ghana for 2 years during which he successfully planted and nurtured wheat for the first time in Ghana. On 10th December 1997 he was appointed as Nazir A'ala (Principal Director) and Local Ameer. Till his election as Khalifa he remained on this office. As Nazir A'ala, he was also serving as Nazir Dhiyafat (Hospitality) and Nazir Zra'at (Agriculture). From 1994 to 1997 he was Chairman Nasir Foundation. At the same time he was President of Tazaeen Rabwah Committee (Committee for the Beautification of Rabwah). He expanded the Gulshan-e-Ahmad Nursery and made a personal efforts to make Rabwah a lush green city. He remained member of Qadha (Jurisprudence) Board from 1988 to 1995. 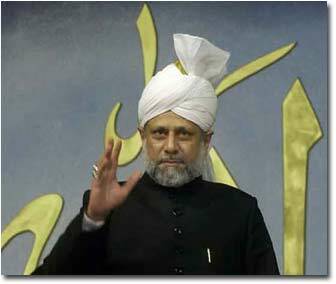 In Central Khuddam-ul-Ahmadiyya (Ahmadiyya Muslim Youth association), In 1989-90 He was Naib Sadr (Vice President) Khuddam-ul-Ahmadiyya Pakistan. In Ansarulllah Pakistan (Ahmadiyya Muslim Elders Association), he was Qaid Zahanat and Sehat-e-Jismani (Physical Health) in 1995, and Qaid Talim-ul-Quran (Quranic Education) from 1995 to 1997. In 1999 he had the honour of becoming a prisoner in the name of Allah, in Rabwah, Pakistan. He was imprisoned on 30th April and was released on 10th May. On 22nd April, 2003 at 11:40pm London Time, his election as Khalifatul Masih V (Fifth Successor to The Promised Messiah) was announced.